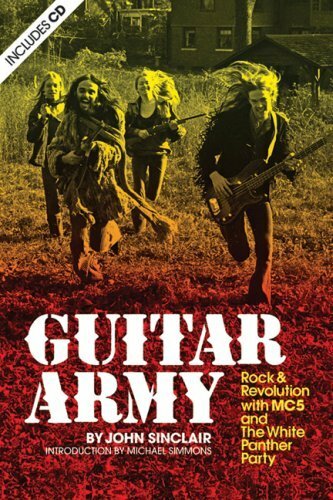 Guitar Army is the incendiary book that proclaimed “Rock and Roll is a Weapon of Cultural Revolution” in 1972. Author John Sinclair spearheaded the leftist revolutionary vanguard White Panther Party and managed the Detroit rock band MC5, leading them from the ferment of the Detroit riots to the Chicago Democratic Convention of 1968, where the band played minutes before police clubbed antiwar demonstrators. In October of 1970, the FBI referred to the White Panthers as “potentially the largest and most dangerous of revolutionary organizations in the United States.” However, just three years earlier, the group’s leaders hosted a “Love-In” on Detroit’s Belle Isle, presided over by Sinclair, whom the Detroit News proclaimed “High Priest of the Detroit hippies.” In 1970 he was arrested and sentenced to 9.5 to 10 years for giving an undercover officer two marijuana joints. Sinclair then became the most celebrated political prisoner of the original war on drugs. After 18 months in prison, John Lennon, Allen Ginsberg, Stevie Wonder, Phil Ochs, and others demanded his freedom with a televised benefit concert attended by 15,000 people. Three days later, Sinclair was released. Guitar Army chronicles these years of revolution through Sinclair’s “street writings” and prison writings, with over 80 photographs, illustrations, concert flyers and comics from the period. This 35th anniversary edition of Guitar Army includes two dozen previously unpublished period photographs, recent writings from John Sinclair, and an introduction from Michael Simmons that leads the reader through the revolutionary times to Sinclair’s life today. Author John Sinclair is the still-charging embodiment of a dazzlingly optimistic time in which change felt necessary and possible. A bonus CD contains rare recordings of MC5 and other Detroit-area revolutionary bands, Allen Ginsberg, Black Panther Bobby Seale on the White Panthers, and original White Panther Party meetings.